SlideShare receives over 60 million visits and 120 million page views—every month. It’s one of the top 150 sites on the Internet. That’s even more impressive because it’s not really a consumer site at all. In fact, the six most-used tags on SlideShare are business, market, trends, research, social media, and statistics. And whether you’re a novice or already active, The Marketer’s Guide to SlideShare will help make you an expert—and grow your business. 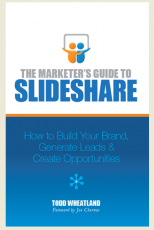 Impact & Opportunity: The Time to Master SlideShare is Now! Jake Wengroff from Frost & Sullivan says SlideShare gives his company thousands of qualified leads a year, and a 50x return on investment. Joe Chernov rates SlideShare in Eloqua’s Top 3 essential social media sites—beaten out only by their own corporate blog and Twitter account. SlideShare makes it easy to take what you’ve already got to a much wider audience. And—in stark contrast to most business’ experiences with social media today—it delivers measurement based on real business activity, like leads. The online revolution has changed the way people buy. Instead of seeking out salespeople who can teach them about products and features, people are searching for their own solutions to problems. To succeed in this new environment, you have to create outstanding content targeting these potential clients, and have it visible in the places those prospects are online. Generate leads and create opportunities. The content revolution has changed the face of marketing. Self-promotion is out; serving with knowledge is in. SlideShare is a business social platform with hundreds of millions of visitors each year—visitors who are searching for the kind of relevant, business-related content that your company can provide. There’s never been a SlideShare guidebook for business use—until now. And whether you’re an experienced SlideShare user, just starting out, or yet to make the step, The Marketer’s Guide to SlideShare is for you. This is a book for anyone interested in building their brand and business online. It’s for all marketers—particularly B2B—who understand the importance of content marketing. It’s for all businesses—solopreneur, consultant, small business owner, or large corporation—looking to generate leads and opportunities. Whether you’re new to content marketing on SlideShare or already an expert, this book will equip you with everything you need to master the most important B2B content sharing platform. Todd Wheatland is VP, Thought Leadership & Marketing, at Fortune 500® workforce solutions company Kelly Services, and is a recognized authority on content, B2B, and social marketing. 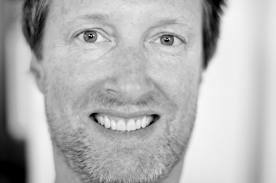 Todd is a frequent speaker at events in the U.S., Europe, and Asia-Pacific, including Content Marketing World, eConsultancy’s FUNNEL, Content Marketing Strategies, and the B2B Marketing Forum. He is also a regular contributor to and information source for industry publications including Social Media Today, Mashable, Chief Content Officer, DemandGen Report, and B2B Magazine. A 15-year career marketer, Todd’s projects have been recognized by the Australian Marketing Institute (AMI)national marketing award, the Killer Content Awards, as well as gold and platinum MarCom awards. Todd was named a Marketer to Watch in 2012 by The Content Marketeer, and is a strategic contributor to the Corporate Executive Board’s Marketing Leadership Council. He is also co-host of the breakout YouTube marketing show, Unsolicited Advice. Australian by birth, he lives with his family in Paris, France. Check out this episode of Content Marketing 360 Radio Show, host Pamela Muldoon talks with Todd Wheatland about his book! Kelly founded the temporary staffing industry in 1946, and has maintained a leadership position through the years based on a valuable premise: we invest in people. Today that focus benefits our customers wherever they operate around the globe—in a growing number of specialized fields. And we’ll continue to meet the evolving challenges of workforce flexibility with staffing solutions tailored to your precise business needs, both locally and worldwide. Kelly Services, Inc. is a leader in providing workforce solutions. Kelly® offers a comprehensive array of outsourcing and consulting services as well as world-class staffing on a temporary, temporary-to-hire, and direct-hire basis. Serving clients around the globe, Kelly provides employment to more than 550,000 employees annually. Revenue in 2011 was $5.6 billion.